What happens when you leave your baby alone with Dad? A re-enactment of "Mission Impossible." 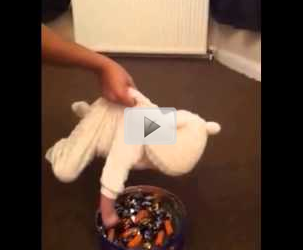 This video shows a baby flying through the air, making its way to a bowl of candy. The baby is then lowered to the bowl, grabs a piece of candy and takes off again. Check out this fun video.